BALTIMORE (AP) An outstanding pitchers’ duel between Carlos Carrasco and Kevin Gausman was ultimately decided by one mighty swing and two nifty defensive plays. ”He dodged a bullet. 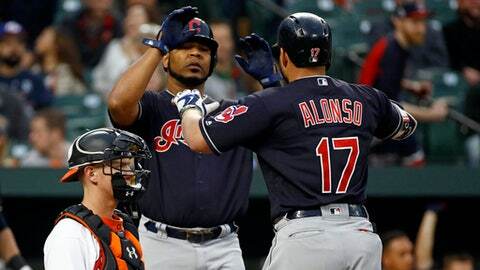 He made a nice play, helping himself up the middle,” Cleveland manager Terry Francona said. Gausman (1-2) gave up two runs and four hits over eight innings, striking out seven with only one walk – to leadoff hitter Francisco Lindor in the first inning. Indians: Zimmer (ankle) returned to the lineup after sitting out Sunday. … 3B Gio Urshela (hamstring) is nearing the end of his rehabilitation assignment with Triple-A Columbus, but his season debut with Cleveland is not necessarily imminent. ”In the next week or so we’re going to have to make a decision” on whether to call him up, Francona said.